Docker is a software layer that permits to run linux application inside isolated containers on an only shared system operating. This type of virtualization is lighter, portable, scalable and easy to manage: it is an good alternative to classical virtualization approach, like xen, kvm, vmware, where every virtual machine run with its own kernel and SO. For my opinion the best virtualization approach doesn’t exit; it depends from what to do. Certainly the docker project provides in a simple way the possibility to delivery an architecture high scalable and available. In this context, this article has the goal to show a solution scalable and high available of a web application, running on a docker cluster with two hosts, proxied by a nginx that, automatically configured by interlock, communicates with a Mysql database. The high availability is reached by docker swarm (https://docs.docker.com/swarm/) and the scalability by interlock (https://github.com/ehazlett/interlock). The architecture above has the following features. The php web application is hosted in an apache container and started by docker-compose. The apache containers are runned on both nodes of the cluster by swarm manager. The apache containers communicate with the database on a overlay network attached on both docker nodes. A nginx is used as reverse proxy and configured automatically by interlock container when the apache containers are created. All the cluster information (number and ip of nodes, overlay network information) are saved in a key value store called consul. Before starting, let’s to introduce swarm docker cluster. Swarm feature has been added natively in docker. You can skip this paragraph and instead of it read this new approach: http://www.securityandit.com/security/deploy-a-stack-to-a-swarm-cluster/. Docker swarm is a native cluster for docker. All the docker hosts are managed by a swarm manager as a single virtual docker host. Every docker runs a swarm agent that registers in a discovery container, consul in this case, the ip address and port of docker daemon: in our case 192.168.1.51:2375 and 192.168.1.52:2375. The swarm manager discoveries all the docker daemons consulting the discovery container and by docker api runs the containers to multiple hosts. With docker 1.12 is possible to manage what the Swarm scheduler does for containers when the nodes they are running on fail. There is the need to permit to containers spanned to different hosts to communicate among them and it’s is done by an overlay network The information about that network is stored by docker daemon in consul server. The php web application stored in an apache container communicates with the dabatase using this overlay network. It does not matter the hosts where the container is running: solution fully scalable. The swarm manager is one only. For configuring multi master swarm manager please read this https://docs.docker.com/swarm/multi-manager-setup/. The communication beewten swarm agent and consul server is in clear. No TLS protocol is used. The database mysql is running only in the first node. Let’s start to install docker-engine and docker-compose. Docker-engine is very easy to install. Now we are going to create a yaml file with all the services running in our architecture. The first service is consul container that stores information about nodes participating in the cluster and about overlay network that permits container running on different nodes to communicates along them. The complete docker-compose file can be download at http://www.securityandit.com/download/docker-compose-swarm/. This consul container will be running on the first node. The parameter “restart: always” assures us the automatic restart when docker-engine goes up. The consule server is listening on 8500 port inside the container and this port is natted to 8500 of consul daemon. Permitting to connect to consul server for storing information about overlay network. Permitting to listen on tcp port (2375 in this case) for receiving connection from a swarm manager running also on different hosts. The docker daemon is listening on 2375 tcp port and in a socket unix. The label db should be present only in the swarm-01 node: this will permit to Swarm manager to start the database only in this node. The option –cluster-advertise is to advertise the docker address to other manager nodes in the swarm: no used in this case because there is one only swarm manager running. If the docker.service is down, for starting the docker is enough to start the docker.socket unit: when a client connects to unix socket (/var/run/docker.sock), systemd automatically starts the docker.service unit. it works like old xinetd daemon. Now let’s start to install the swarm docker cluster. The Swarm manager is the central point of the cluster. It finds the nodes of the cluster consulting the discovery server and orchestrates the running of containers on them. The swarm manager is listening on 8333 port natted to 2375 container port and it connect to consul server to 8500 port. The cluster status is showed in this way: the healthy state confirms the the node is registered well in the consul server. From now on, every container is started by swarm manager that runs the containers connecting directly to docker engine listening on 2375 tcp port of any host. Let’s show an example with hello-world where the container is started on second node. The swarm cluster has been configured; let’s start to configure interlock container for scaling automatically the apache container on nginx. Interlock is a container that interacts with other Docker containers, when docker event stream are received by swarm manager, configuring the extension, nginx in this scenario, and then reload it. Interlock is always started with docker-compose adding this configuration in the env.yml. Interlock works in this way: every container, labelled with interlock.hostname and interlock.domain, is added automatically in the nginx configuration as virtual hosts hostname.domain. The nginx is started in the swarm-02 and it will balance the http request, automatically configured by interlock, to apache web server. Before testing the architecture, the php apache and mysql containers must be started. Let’s explain how to do that. The web application balanced by nginx is written in php. It’s very simple: a simple php that logs ok or error in case the connection to database completed successfully. In real life it can be more complex. The example is from site https://medium.com/dev-tricks/apache-and-php-on-docker-44faef716150#.arf1kz17c. # Install apache, PHP, and supplimentary programs. openssh-server, curl, and lynx-cur are for debugging the container. # Update the PHP.ini file, enable <? ?> tags and quieten logging. # Copy this repo into place. # Update the default apache site with the config we created. # By default start up apache in the foreground, override with /bin/bash for interative. 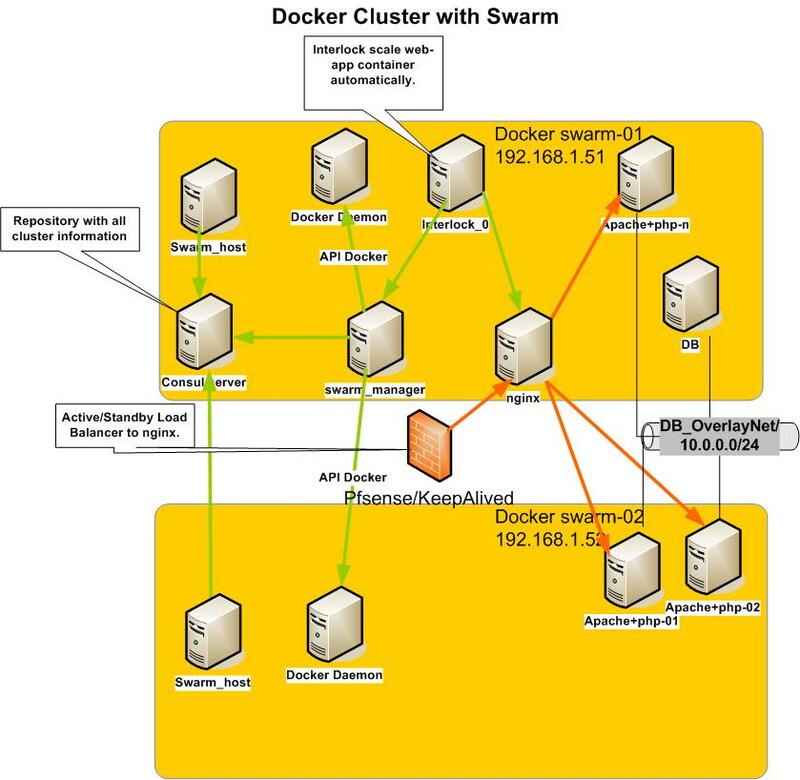 [root@swarm-01 apache]# docker build -t web . The web image has been created and ready for starting a container from it. From moment that I don’t use a docker registry as image repository, it’s necessary to build it on both nodes. The apache containers has a new interface in the network my-multi-host-network: the overlay network spanned to both hosts permits to containers in hosts different to communicate among them. The information about overlay network is saved in the consul server and this is the reason for what the docker engine is started with a parameter set to the consul server address. We could choose another different network for the overlay network: i prefered to use the default 10.0.1.0/24. The suggestion is to avoid overlap with the local subnets. The container_name is db: it permit to apache container to contact the database using container_name as host address that is resolved by a internal dns inside the container with the overlay ip network provided to database. The constraint storage==ssd forces the swarm manager to start the container on the host with this label, swarm-01 node in our example. PING db (10.0.1.3) 56(84) bytes of data. The db and the web containers are in the overlay network. The containers with an interface in an overlay network has two network interfaces: one belongs to overlay network and the other is connected to docker_gwbridge. inet 172.18.0.5/16 scope global eth1. The eth0 is connected by vxlan tunnel to other cluster hosts: note the mtu set to 1450 because the other 50 bytes are used by tunnelling protocol. The eth0 is connected to veth10 of another hidden namespace; this veth10 is connected to a hidden bridge br0. In this hidden namespace the vxlan tunnel to other system has been configured. 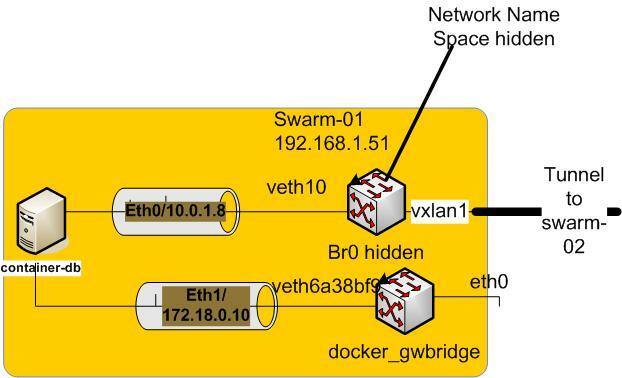 For the vxlan protocol please read this article https://www.kernel.org/doc/Documentation/networking/vxlan.txt. After understanding how to work the overlay network, let’s to test the architecure. In this case four apache containers has been created: tree running on second node, one on the first. The destination nat from a random to http 80 port permits to reach the web server directly from nginx even if they are running on different hosts. The balancing performed by nginx is correct: it can be tested contacting more times the application server by curl. For contacting the nginx I configured in the hosts of the system the mapping test.local–192.168.1.52. In general, don’t forget to configure in a balancer like keepalived, haproxy or pfsense, a virtual server configured in active standby way for balancing the traffic to active nginx. Read this my article about that http://www.securityandit.com/system-and-network/nginx-haproxy-and-keepalived/. The last thing to test is the high availability provided by swarm cluster and docker engine. The solution showed is fully scalable but it should be improved for production enviroment where security requirements and more high availability are required. For these reasons, the following should be applied in a production context. Communication between swarm manager and docker daemon in TLS..
Comunication beewen swam and consul in TLS. More consul servers and swarm manager in order to delete the single point of failure on them. Configuration of a database in active standby using DRBD and Heartbeat for example. It useful to configure a docker registry as central repository for all the images. Don’t hesitate to contact me for any suggestion or issue about this article.